As you enter Dolliver Memorial State Park from the south on highway D33 the road descends through a lush tunnel of trees. This road will take you past most of the parks amenities such as two well maintained 1930’s era lodges and an open shelter. At one point, Prairie Creek stream flows over the park road and is a popular spot to play or wade in the water. Dolliver also has a variety of pick-nick areas with tables and grills, a campground, group and family cabins, playground, and a paved boat ramp with a dock on the Des Moines River. The campground is small but still a nice size with 22 electrical sites and 2 without electricity. Renovations to the campground upgraded the electrical, added crushed stone to the camping pads and created several pull through sites. Some camping rigs may find the turns a little tight and the dump station could be awkward for large campers. The bathroom facilities are well maintained and clean. On select weekends you might hear the bells of an ice cream truck. A private vendor rolls through the campground twice a day selling sweet treats off the back of his truck. Cell phone reception is poor at the campground which makes for one less distraction. The trails are very manageable north of the camp ground. Dolliver’s northern trails will take you along side the Des Moines River, up to Bone yard Hallow and on to the rim of the valley. Trails south of the campground offer more challenges. The terrain is rugged; however, the trails are well maintained. This area of the park offers beautiful vistas and unique geology such as the copperas beds. The copperas beds are colorful mineral deposits located on a 100 ft. wall of exposed sandstone. Petrified logs and sticks can also be found around the Copperas Beds. In the southeast area of Dolliver the trails take you up to three Indian burial mounds on a timbered ridge. You can also access the river by hiking down a series of overgrown, but, scenic stone stairs. People enjoyed cruising through Dolliver for a scenic drive. Most drivers were very polite and traveled at the posted speed limit. Occasionally there is a loud car or motorcycle that could be herd throughout the park. The park rangers do an excellent job of patrolling and they are visible during day and evening hours. 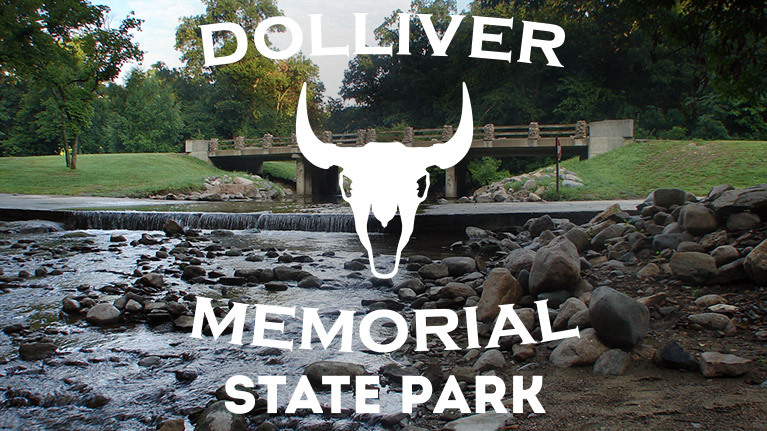 Dolliver Memorial State Park resembles an intimate version of Ledges State Park in Boone County. What is unique about Dolliver is the proximity of the campground to the river. The park feels like another world compared to the farmland surrounding Dolliver. If you’re looking for a last minute outing check the Iowa DNR Online Reservations System. Dolliver doesn’t seem to fill up as quickly as other state parks on busy weekends. Do you know what kind of oak trees are in Dolliver? I don’t know the predominate species in the park but it would most likely be a mix of Black, Red, Chinkapin, White and Bur Oaks.